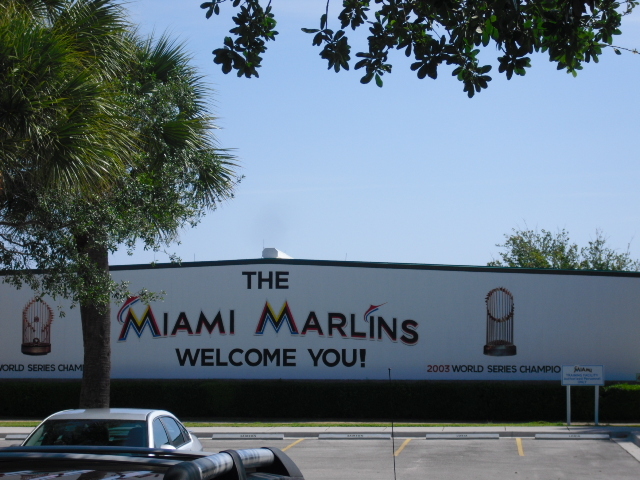 In less than two weeks, the Marlins will officially set up their Spring Training camp in Jupiter, Florida for the 2013 season. Miami is coming off an offseason packed with seismic lineup shifts. After a mammoth salary dump, the Marlins will be taking the field in Jupiter with a plethora of young players. Fans and experts alike are concerned with the youthfulness of Miami’s starting rotation, but the lack of experience in the Marlins’ lineup is equally concerning. Currently, the outfield is the most potent and solidified portion of Miami’s roster. The subtraction of Emilio Bonifacio was the only major change to the outfield this offseason, and his spot was quickly filled when the Fish signed Juan Pierre. Pierre, who was on the Marlins’ 2003 World Series team, will man left field. Justin Ruggiano, who had a breakout year in 2012, will roam the vast centerfield of Marlins Park. And the always-electrifying Giancarlo Stanton will take up right field. With any luck, Stanton will overcome his knee troubles this year, and be able to stay in the lineup for the majority of the season. He is currently playing in the World Baseball Classic for Team USA, experience that will hopefully heat his bat up before the season starts. When the Marlins traded the bulk of their 2012 salary to Toronto in November, they received several highly-touted prospects in return. The prize of that bunch was shortstop Adeiny Hechavarria. Hechavarria hit .254 in 41 games last season for Toronto. He’ll man short this year for Miami, and Donovan Solano is currently slated to take over duties at second base. Neither has ever been an Opening Day starter for a Major League club; therefore, it will be interesting to watch the how the duo plays out this season. Unfortunately, the Marlins are not deep in either of the middle infield positions. Solano also has some experience at short, so in the case of an injury to Hechavarria, he will likely take over. However, the only other Marlin who has played second base is Placido Polanco, who is currently slated to start at third. Chris Coghlan has played outfield during his entire Major League tenure, but he played second and third base in the minors, and will likely be most valuable as a backup at either of those positions. Nick Green is a non-roster invitee to Spring Training, and has experience at both third and second base, so it is likely he will be admitted to the roster for the purposes of adding infield depth. In addition, Matt Downs (1B) and Kevin Kouzmanoff (3B) were given deals to try out at camp, and both have Major League experience. Rob Brantly is the Marlins’ most experienced catcher. The 23-year old came up to the big leagues last year, and hit .290 in 31 games. A young catcher trying to handle a young pitching staff is no manager’s dream, so this situation will be another interesting aspect of the 2013 Marlins. All these young players certainly have Major League potential, and have shown their ability enough to be considered top-tier prospects, but none of these guys have enough bat power to make Miami an offensive powerhouse. Giancarlo Stanton boasts the best pop on the team, but his ability may become obsolete if he is not protected in the lineup by anyone. Given the stature of the current starters, it is likely that Stanton will lead the league in intentional walks as opposed to home runs. Without any power behind him in the lineup, there is no reason Stanton should see many nice pitches from National League arms this season. On February 15, the Marlins will hold their first full team workout in Jupiter, where hopefully this spring, questions will be answered, and players will rise to the challenge to solidify the lineup.